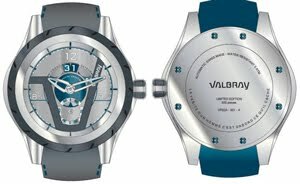 By introducing, in world premiere in 2010, a timepiece equipped with a circular shutter system hidden under the bezel, Valbray sparked the interest of the watchmaking world. This shutter mechanism is activated manually by turning the bezel at 90°, thus moving the 16 extra-thin blades that slide one over the other until they completely disappear, allowing to view the underlying dial. Entirely conceived and developed internally and then patented, it has been designed for superior ergonomics, smooth operation and countless rotation cycles. The metallic blades undergo a series of specific treatments to ensure their protection from friction and their perennial appearance. Made of more than 88 individual components and completely waterproof, the system is a modern micro-technology masterpiece applied to watchmaking. Its second collection, to be presented in 2012’s Baselworld, focuses on circularity as a way to enhance the interactivity of the watch. The innovativeness of the Oculus V.02 Grand date collection lies in the re-engineered patented diaphragm system. This new version, even smaller (with a diameter of 43mm), allows intermediate openings in its course, thus permitting a step by step reading of time. The V.02 timepiece becomes therefore the first in which a different function is displayed at each circular opening phase, with the obturator acting as a cursor to the underlying dial. With its shutter closed, the watch is an elegant and minimalistic two-hand one (1). At the first step at 30o, a delicate “petite seconde” wheel appears (2). At the second step at 60o, an imposing “grand date” comes (3). At the third and final step at 90o, the “petite seconde” and the “grand date” merge gloriously with the hours’ indicators and the minutes’ path (4). The “turning” effect is accentuated by the engravings on the bezel that follow the shape and the position of the shutter’s blades. The sensual ovoid shape of the case is emphasized by the chamfers all along the pure side line. 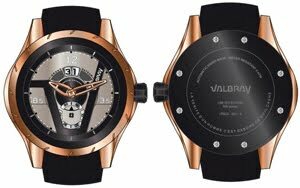 is A small touch of impertinence is present on the dial with the use of half hours at 3.5 and 8.5, while the refined design of the multilayered dial and the path of the hours testify to the meticulous style of the Valbray watches. The Oculus V.02 Grand date collection is a nod to the symbolism and balance of the circle, a shape apparent constantly on the watch: from the wheels of date and seconds to the “ring” of the bezel and the flange, circularity imbues the timepieces with its allure. 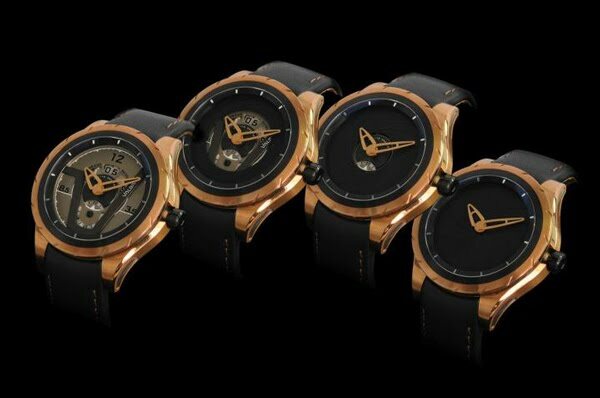 Elegant and classic, it is made of 18 carat satin-finished red gold with its bezel treated with black PVD. Sportive and with a strong personality, it is made of stainless steel with its bezel treated with black PVD. 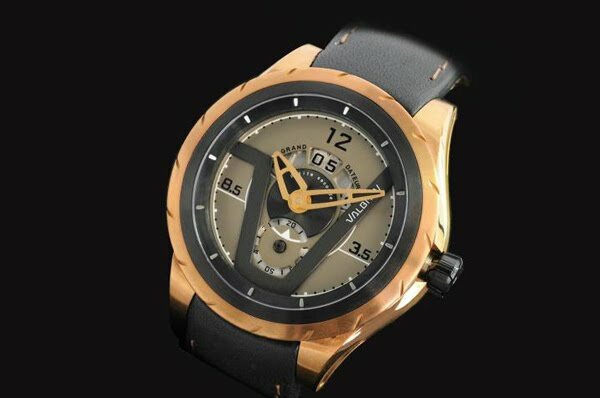 Its dial is multilayered and sand-blasted, with its central plaque finished with cotes de Genève. 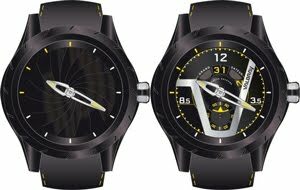 Playful and dazzling, it is made of stainless steel with its bezel treated with black PVD. Its dial is multilayered, with a sunray-brushed central plaque. Intriguing and modern, it is made of stainless steel that has been treated with DLC. 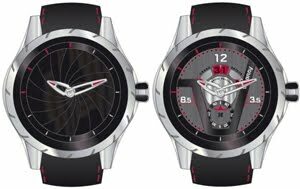 Its dial is multilayered with a vertical satin-finished V.
With a very high-tech look, it is made of stainless steel with its bezel treated with graphite grey PVD. 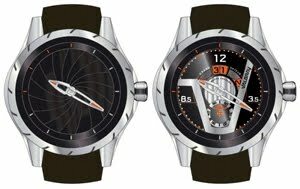 Its dial is multilayered and sand-blasted.